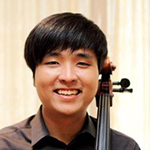 Ju-Young Lee, a native of Kansas City, Missouri, is a recent graduate of The Juilliard School, where he earned a bachelor’s degree for cello in 2013. He has studied under the tutelage of Joel Krosnick, David Soyer, and Felix Wang. He has given solo recitals and participated in chamber music performances in both the US and South Korea, in cities such as New York, Nashville, Seattle, Chestertown, MD, Blue Hill, ME, Brevard, NC, Steamboat Springs, CO, and Washington, DC. He was invited as a guest soloist with the Nashville Symphony, the Curb Youth Symphony, and as a rehearsal soloist with the New York Symphonic Arts Ensemble.